The album will play from 8PM -10PM during which time there will be an open Budweiser bar. 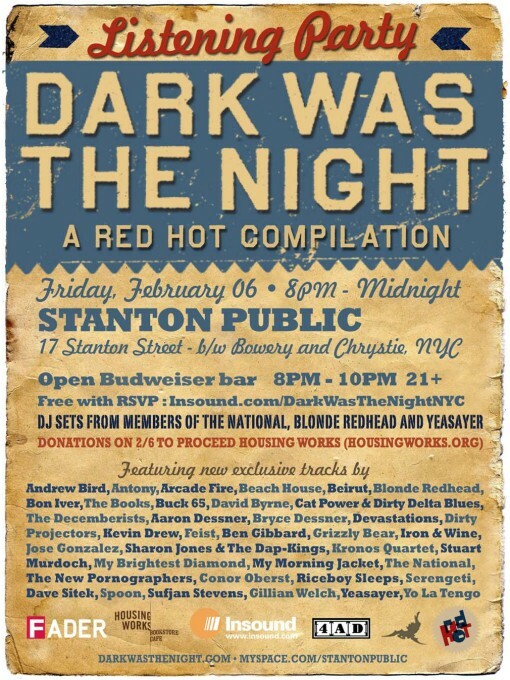 From 10PM until at least Midnight there will be DJ sets from members of The National, Blonde Redhead and Yeasayer and surprise guests. Make your own DWTN widget over here. Full Dark Was The Night track listing after the jump. Dark was the Night will be officially released on Feb 17th, 2009. All proceed from the sale of this record go to charity.